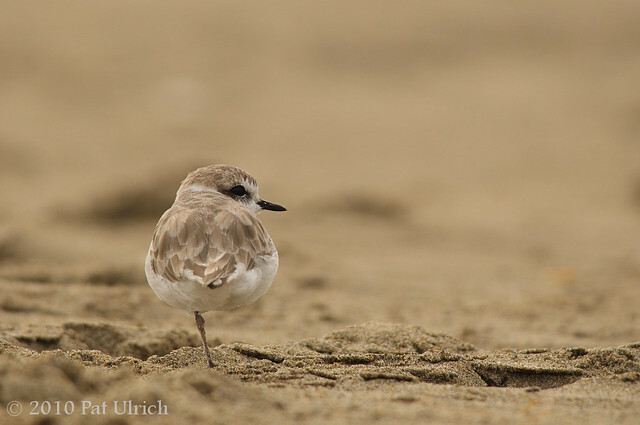 A western snowy plover (Charadrius alexandrinus nivosus) standing around on Limantour Spit in Point Reyes National Seashore. At this point in time it had popped up out of one footprint in the sand to have a look around before plopping down into a different one. Pat, you're getting some great shorebird photos at Limantour. I've got to get out there. Thanks, Jim -- I've gone to many places around the Bay Area looking for shorebird photography opportunties over the past few years, but the one I keep coming back to is Limantour Spit. There's always a good chance for sanderlings (and other peeps) and I've never had a trip without seeing some snowy plovers as well.